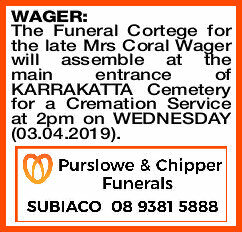 The Funeral Cortege for the late Mrs Coral Wager will assemble at the main entrance of KARRAKATTA Cemetery for a Cremation Service at 2pm on WEDNESDAY (03.04.2019). 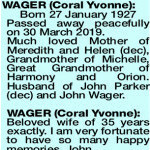 WAGER CORAL YVONNE Born 27 January 1927 Passed away peacefully on 30 March 2019. Much loved Mother of Meredith and Helen (dec), Grandmother of Michelle, Great Grandmother of Harmony and Orion. 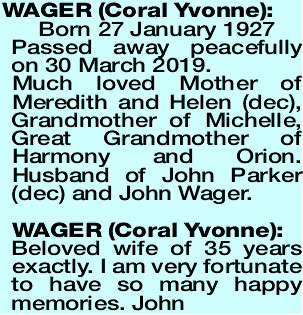 Husband of John Parker (dec) and John Wager. 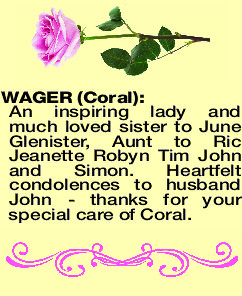 WAGER CORAL An inspiring lady and much loved sister to June Glenister, Aunt to Ric Jeanette Robyn Tim John and Simon. 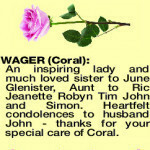 Heartfelt condolences to husband John - thanks for your special care of Coral. 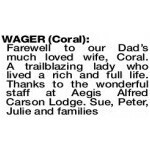 Dear sister-in-law to Allan and Margaret. 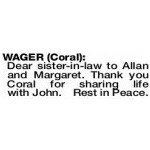 Thank you Coral for sharing life with John. Rest in Peace.